When you strolling along the seafront, do you cast your eyes over the yachts picking out your favorite? Do you look longingly at the boats for sale in the shop windows, fantasizing about which you would have? Perhaps you tried to state your desire with day trips to an island or a sail around the bay. This was definitely us so, when it came to planning the most romantic and extravagant trip of them all, The Honeymoon, I suggested we look into chartering a yacht. I set my now-husband on to the task, as I was busy organizing absolutely EVERYTHING else for the wedding. After much research, he decided that we would go to the Dalmatian coast. Although becoming increasingly popular, it still offers good value over similar holidays in Italy and it has many more idyllic islands to explore. There is a perfect balance between nature, culture, history, and fun to be had in this part of the Adriatic. 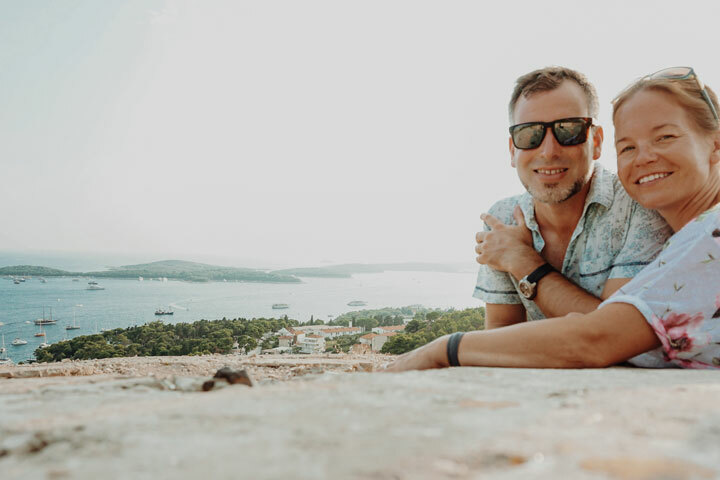 Having been there and done it, I can write this with the benefit of hindsight and give you an insight into how absolutely amazing it can be to honeymoon on-board a yacht in Croatia. It was such a good call to have some time on our own before we set sail. The flights from our local airport to Split ran Tuesdays and Saturdays, so we decided to head out early and spend four days in the heart of the Diocletian’s Palace. We hired a private apartment and could drop in and out of the hustle and bustle as we wanted. There are also plenty of boutique hotels if that is more your style. Relaxing days, acclimatizing to the weather and the pace of life; lazy breakfasts, digesting the memories of the wedding; strolls to the park and the beach beyond for a dip in the sea; escaping from mounting afternoon crowds for a sneaky siesta, emerging in the evening for dinner in some romantic restaurant or other; then wandering the deserted streets in the dead of night when the illuminated buildings look incredible. This was much-needed downtime to unwind from the stresses and exhilaration involved with hosting a wedding; a time for just the two of us to unite and grow together. 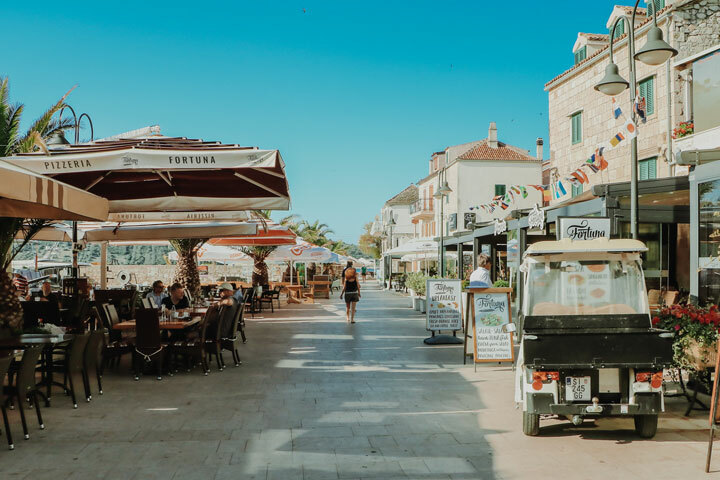 We chose Split, but Dubrovnik or Zadar would be just as fantastic, all are beautiful cities with historic old towns to die for, great restaurants and plenty to explore. The benefit of hindsight is a great thing… it took 5 minutes to realize that it would have been better to get a yacht with a/c. No, as complete novices we didn’t realize this was even an option. However we now know that it isn’t an option, it is a necessity! If the budget had allowed, we would also have chartered a catamaran. The double hull gives that bit of extra privacy that a honeymoon deserves and above deck there is plenty of space to engage as much or as little as you like with the crew. Even if you have sailing experience, you want to be able to relax and enjoy your honeymoon without anything getting in the way. 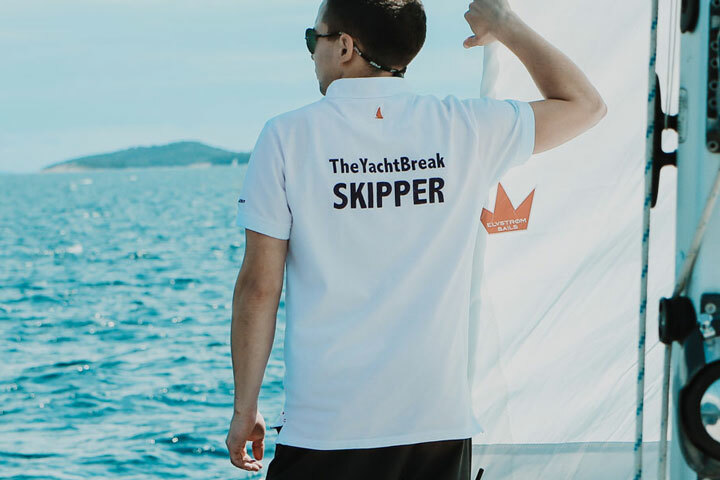 A first-class skipper brings extensive local knowledge and skills as well as being reliable, discrete and sensitive to your needs. A good hostess will ensure you don’t have to lift a finger, always ready with drinks, snacks and mouth-watering meals. They take the hassle of provisioning out of your hands and ensure the catamaran stays clean and tidy. If you really want to get away from it all, you could even bring a top-notch chef on board to create culinary masterpieces…. however, I enjoyed trying out the local restaurants on whichever island we found ourselves near. The best time to enjoy the Dalmatian coast is in September; schools have started back and the crowds are dissipating. The weather is still hot, the sea warm (24°C) and there is enough wind to enjoy sailing. Alternatively, consider coming in the second half of May into early June; although the sea is cooler (around 20°), the days are long, and summer arrives rapidly. 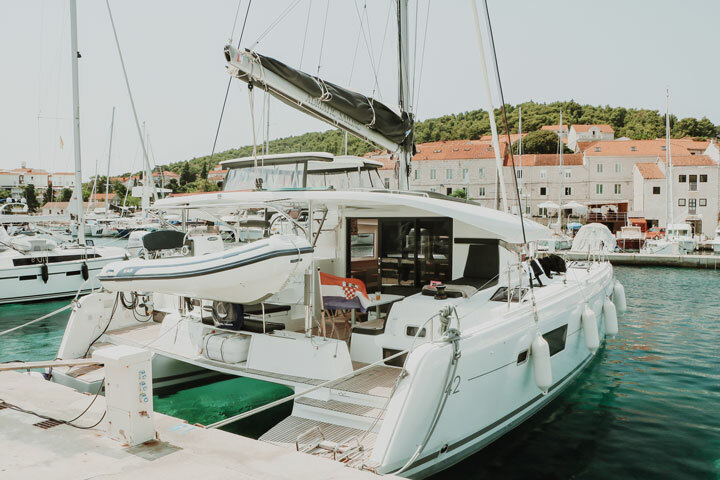 Croatia in June, July, and August is increasingly becoming overwhelmed with tourists and although you can leave them behind while on your own private catamaran, stopovers in marinas and harbors are busy and fees are higher. Restaurants and moorings will need to be reserved further in advance, taking away the ability to act on a whim and make spontaneous decisions. This really depends on what you are in to. There is something for everyone on this type of holiday – those who want to be looked after and those who enjoy getting stuck in, active/adventurous explorers and those who prefer a slower more relaxed pace. The islands are generally close together so sailing between locations only takes a few hours. During voyages, you can be as detached or involved as you like. We sunbathed and read books but also relished the opportunity to help sail the yacht when the wind got up. Once on the anchor or tied to a buoy, diving off the yacht into crystal clear Adriatic waters to watch fish devour leftovers in a feeding frenzy was generally my first call. We were gifted SUPs as a honeymoon present, perfect for paddling off to explore the coastline. It is great to drift out into the bay to find a romantic spot to watch the sunset. At night, there is nowhere better to stargaze from than the deck of a catamaran. On the islands, villages and towns have a delight of narrow shade-rich streets and alleys to lose yourselves in. There are plenty of konobas (taverns) to top up hydration levels en route. Often, they have a fortress to wind your way up to, for views back over terracotta rooftops towards the archipelago of islands on the horizon; a welcome drink from a well-placed bar and a perfect spot to watch the sunset as a reward for the exertion. 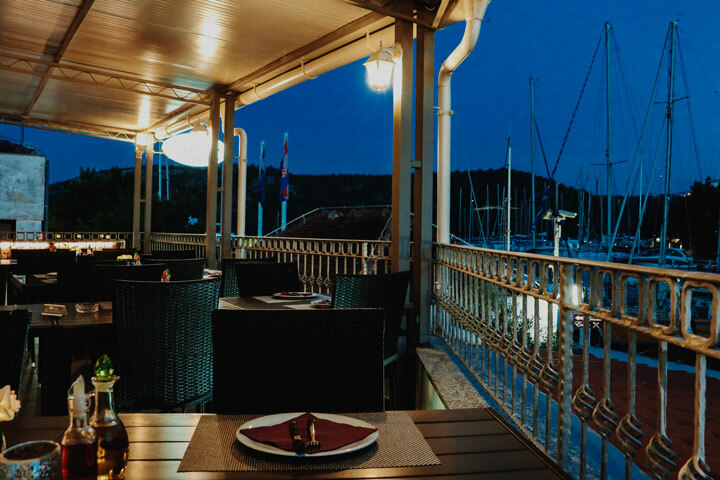 There are endless opportunities for intimate evening meals at charming restaurants. Our skipper, Tilen, was exceptional at booking us into the most amazing establishments; walking us through the back streets to some door in a wall which would open onto a romantic courtyard with little tables nestled on terraces, leaving us there to be served delectable local food. Like many couples these days, we had been together for a lifetime already. We had no need for toasters, glasses or cutlery, however guests still wanted to get us something special. There is nothing more precious than memories and time; so we asked them to help us create the holiday of a lifetime. Our honeymoon would not have been half as good without the help of family and friends; we were able to split it down into parts that could be promised. This meant that rather than just giving cash it was possible to take ownership of actual items and activities. There are plenty of websites online that allow you flexibility with wedding lists in this way, we used www.whattogive.com. All it required was a little thought into the things we would like to do while we were away and some research into prices. Onboard we were gifted the skipper, SUPs and a high-quality waterproof camera to take. You could even add Sea-bobs, the hostess and a Chef to your list. We received entry into Krka national park and an awesome Zipline experience in Omiš, not to mention sea kayaks and white-water rafting. Top notch dining experiences and meals out allowed us to toast our benefactors and remember what lovely friends we had. 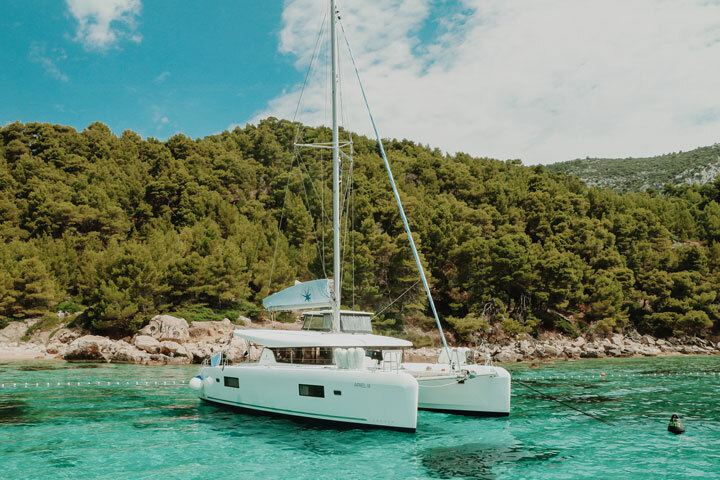 Opting for a romantic getaway on-board a catamaran off the Dalmatian coast is a perfect way to celebrate a very special occasion and one you will never forget.